October 29, 2008 at 10:04 PM · I've only used Aubert bridges. I would like to know about Bausch and Despiau bridges. How are these different from Aubert? October 29, 2008 at 11:48 PM · Bausch are basically trash, very soft wood and unattractive cut, not anything for a quality instrument. Despiau are harder than Aubert, and my current favorite is Milo Stamm, which are all, even the lower models, of beautiful creamy AND hard wood. Stamm bridges come in a wide range of styles and widths, which is very useful, also. Aubert treated bridges are currently my least favorite, because the wood can be hard to cut cleanly, and I don't like the softer wood. I haven't found any tonal results from them that I couldn't get another way with Stamm bridges. October 29, 2008 at 11:47 PM · Hi Anthony, I've used bridge blanks by all of these manufactures: Aubert, Despiau, Bausch, and in addition, I've also used blanks from Teller, and Milo Stamm. 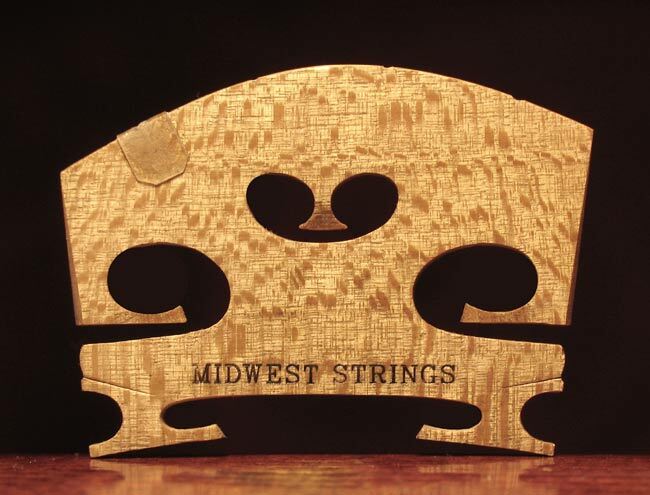 All of these companies make bridge blanks in different sizes and in different grades for the different string instruments, so your question about the differences can only be answered in general terms. I generally think of the Bausch blanks as student level as they are generally made of softer maple. Aubert blanks used to be the preferred blanks, but recently, I think that the Despiau have surpassed them in quality. My current favorite bridge blanks are made by Milo Stamm. These are very nice in consistiency and quality and the maple that is used is of good hardness and density. October 30, 2008 at 12:29 AM · I would agree with the quality of the Milo Stamm bridges. As far as new bridge blanks go, I would say they are the best. A lot of people like the Despiau blanks. I've never really liked them, but that isn't because of any lack of quality. I'm lucky to have a large supply of old Aubert blanks from the early fifties, so that is primarily what I use. If not for that supply, the Stamm bridges would be first on my list. October 30, 2008 at 12:52 PM · I've noticed that bridge manufacturers have different grades for their bridges. What is the difference between the grades? Will a high grade bridge typically give you better tone? The price range is pretty amazing with $2.81 for the lowest Aubert#5 to $17.57 for an Aubert #8. October 30, 2008 at 01:45 PM · The difference is the quality of wood, and this is more marked in the Aubert line than the others. Not only do the lower Aubert grades look different--wider, more random, less-straight grain, worse quartering, runout--but the wood itself is worse in hardness and texture. With other brands' different levels the difference is mostly cosmetic, and even that doesn't vary as much as with Aubert. Twenty years ago I was more enthusiastic about Aubert #5s because the next step down was a very big one. Now, however, the other makers' low end bridges are better than Aubert's. It's also much easier to cut a nice-looking bridge from a Stamm blank. October 30, 2008 at 01:49 PM · stupid question: understand that luthiers need to "cut" the blanks to fit individual violins. at the factory how do they turn a block of wood into individual blanks,,,with machines nowadays? November 3, 2011 at 10:48 PM · How would people rank Milo Stamm Royal, Despiau Superieur Grade A (3 Tree), and Josef Teller Royal De Luxe? I have seen lots of great reviews on Milo Stamm. A lot of people say that Despiau is hard to carve. Out of all of these I have not seen people comment about Teller's Royal De Luxe bridges. Can people give me some information regarding these? How is it compared in quality wise to the other two brands? Where is it in terms of hardness? November 4, 2011 at 02:15 AM · Ed Maday, a very fine maker who is very good at tonal adjustments, etc. usually uses either the top grades of Aubert or Despiau, depending on the particular blank and what he thinks will go best with a particular instrument. November 4, 2011 at 03:42 PM · I use Despiau A-grade, model 11 for violin and viola since a few years, and I'm very happy with the result. Very homogenous and easy to carve, and I like the model. I think the important thing is to stick to your material, if it's consistently good quality. Then you can get to know it well and perfect the way you carve bridges to get the result you want.